Jean-Pierre DANEL est le guitariste instrumental le plus vendu en France, notamment avec ses albums Guitar Connection, N°1 des ventes d'albums en France en 2006, et Out Of The Blues, un album de duos sorti en 2010. Devenu professionnel en 1982, à l'âge de 14 ans, il a d'abord enregistré en studio avec les meilleures équipes musicales françaises, puis a publié de nombreux albums de guitare instrumentale, longtemps sortis principalement à l'étranger, puis finalement en France. Il reçoit divers prix (deux Awards de l'Instrumental Rock Guitar Hall of Fame aux USA, le Grand Prix Français de la Guitare, etc.) et de nombreux disques d'or en France et à l'étranger (Angleterre, Pays-Bas, etc.). En 2001, il est invité sur l'album Masters de la Guitare, où figurent également Eric Clapton, Santana et B.B. King. En 2006, son album français Guitar Connection est N°1 du Top 50 et double disque d'or ; il est l'album de guitare instrumentale le plus vendu de l'histoire du disque en France. Il est suivi de plusieurs autres, certains comprenant des duos avec des artistes comme Laurent Voulzy ou Hank Marvin. Fin 2010, il sort Out Of The Blues, un album vendu au profit de Aides et de la lutte contre le sida, où il interprète des duos avec 24 invités (Louis Bertignac, Michael Jones, Axel Bauer, Laurent Voulzy, Paul Personne, Anne Ducros, Fred Blondin, et les grands guitaristes Hank Marvin, Albert Lee, Andy Powell, Scott Henderson, etc.). L'album est enregistré dans 6 pays, et notamment aux studios Abbey Road à Londres, rendus célèbres par les Beatles. Le soutien apporté à Jean-Pierre DANEL par des musiciens comme Brian May du groupe Queen (qui se déclare fan de Danel dans le livret de l'album), et par Carla Bruni lors de la soirée annuelle de Aides où il est officiellement lancé, apportent au disque un buzz important. L'album recevra un disque d'or et le DVD un disque de platine. La plupart de ses albums et DVD ont d'ailleurs reçu disques d'or et platine et flirtent avec les hauteurs du Top 50, où, malgré une grande discrétion médiatique, il a classé depuis ses débuts 39 albums et singles instrumentaux, parfois dans plus de 10 pays. Parallèlement, Jean-Pierre DANEL mène une très prolifique carrière de producteur, travaillant dans tous les domaines musicaux, de la variété au jazz, en passant par le classique, la dance ou les disques pour enfants. Via sa société fondée en 1989, il rachète également les masters de plus de 18 000 chansons, qu'il remastérise et réédite avec succès. Ses productions cumulent à ce jour 181 disques d'or et platine, 343 disques classés au Top 50 et 22,3 millions d'exemplaires vendus. Egalement auteur, il publie une douzaine de livres variés, dont un essai : Sacha Guitry et les femmes, et La Légende de la Fender Stratocaster, dont il est un collectionneur internationalement réputé, avec notamment « Miss Daisy », une des Strat les plus rares et les plus renommées au monde. 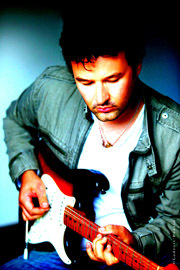 Jean-Pierre Danel (born June 4th, 1968) is a French self-taught guitarist, record producer and composer. Danel started his career as a professional guitarist in July 1982, at the age of 14. He was then mainly influenced by English guitarist Hank Marvin of The Shadows. After many tours and studio recordings with French session musicians and singers, he released various guitar albums, winning 8 gold discs in Europe.In the US, his album "Stratospheric" was voted Best Album of the Year 2000 by the Instrumental Rock Guitar Hall Of Fame, and Danel was also named Composer of the Year for his track "Ballad For a Friend".As a guitarist, the Instrumental Rock Guitar Hall Of Fame described him as "brilliant and expressive". In 2001, he played on "Guitar Masters –The Greatest Guitarists in the World", on which Eric Clapton, B.B. King, Carlos Santana or Al di Meola were also invited. As a producer, he started his own company, Puzzle Productions, in 1989. He produced dozens of hit records and also bought the rights for many songs from other companies, creating a 18.000 songs catalogue. Record industry specialists presented Danel in various TV documentaries as one of the biggest independant producers in France, with 22.4 million copies sold, 181 gold and platinum discs and no less than 358 hits records, sometimes in 36 countries, including 24 #1 records. His work also includes the production, with DJ Da French Guy, of radio remixes for artists such as Madonna, Britney Spears, Daft Punk and Moby. In October 2002, with the re-release by Sony of a part of his back catalogue, he became the producer with the highest number of albums and singles in the French national charts during one same week, with 19 records ranked. His own album "Guitar Connection", released by Sony/BMG in July 2006, is the only instrumental guitar album to reach the #1 spot in the charts in France,and received a double gold disc (for more than 160,000 copies sold) and later a platinum disc. The DVD received a double diamond disc, and two singles hit the Top 20. "Guitar Connection 2"was released in March 2007, hitting the charts at #8.The album features some famous guest stars, and includes a duet with British legend Hank Marvin on the standard "Nivram". The single hits the French charts at #15. His duet which French star Laurent Voulzy hits the charts at #7, followed by another hit single at #13. "Guitar Connection 2" received a gold disc and the DVD a double platinum disc. In June 2007, Danel received the "Grand Prix Français de la Guitare" award,as well as a multi-diamond distinction award for 25 years in the music business. In March 2008, his single "NZ Girl Blues" hits the charts at #5. "Guitar Connection 3"hits the charts at #18 in July 2008, the DVD gets a platinum disc and two singles enter the charts, including "The Pink Side of Miss Daisy", which goes to #9 and later gets a gold disc, and a Top 20 hit with a version of "Honky Tonk Woman". In March 2009, "Guitar Connection –Tribute to The Shadows" hits the album charts at #6, provides a hit single, and the video version gets a gold disc. Then, "The Best of Guitar Connection"hits the charts at #23 in September 2009 (and will later get to #2 on the downloading charts), followed by the double album "Jean-Pierre Danel plays The Shadows" at #38. "Guitar Connection Anthology" follows at #19. In November 2010, his charitable "Out Of The Blues" guitar album to the benefit of Aids research, is released by Universal. Danel records duets with 24 guitars greats such as Hank Marvin again, Albert Lee (recorded at the legendary Abbey Road Studio 2), Scott Henderson, Andy Powell of Wishbone Ash, Jake Shimabukuro and various very popular French artists. The first single, also titled "Out Of The Blues", had hit the Top 20 in March 2010 as an avant premiere, and the album hits #3. 2 Top 40 and Top 20 hit singles follow, plus a string of Top 10 hits on iTunes as well, including a #1 hit single in Belgium, a long-running Top 5 hit with Axel Bauer, staying in the charts for more than two years. 8 singles in all hit the iTunes charts in several countries, such as the USA, Ireland, Portugal, Germany, France, Sweden, Finland, Luxemburg, Belgium, etc. The album gets support by various people, such as Carla Bruni, then First Lady of France, or Brian May of Queen. The DVD gets a platinum disc in February 2011 and the album a gold disc. "Out Of The Blues" hits the Top 30 when it reenters the charts again in 2011. In October, Universal releases a 5 CDs box set with an anthology of Danel recordings over the last 29 years as well as several compilations on downloadings. Two of those albums hit the charts, at #9 and #14 in France, as well as compilations in various countries such as Israël, Taïwan or Dominican Republic. The old album "Stratospheric" makes a brief entry in the charts as well and Sony releases a 3 CD metal box set in 2012. An English speaking DVD/Blue Ray for the US market, "The Story of the Fender Stratocaster", will be released in 2013. Danel introduces his collection, and especially his scarce 1954 preproduction Stratocaster model named "MissDaisy", an iconic guitar which can be found as a life-sized poster at Le Louvre museum gallery, as well as in several books. Danel is listed among the 30 greatest Stratocaster players in Rolling Stone magazine in December 2009. Danel also wrote a dozen of books, including "Femme mode d'Emploi" (quotations about women), and "Tribute the Fender Stratocaster"based on his guitar collection (foreword by Hank Marvin) in 2012. In 2007, he published two biographies of French playwrighter, director and actor, Sacha Guitry, an funny second-degree autobiography and several other books. Jean-Pierre is the son of the French pop singer Pascal Danel and the nephew of opera director Jean-Pierre Ponnelle.